Never short of ideas, GTA — the series promoters — know that the championship is one of the toughest in the world and have made strategic alliances with other promoters worldwide to help maintain its stability. Endurance-Info caught up with GTA CEO Masaaki Bandoh to discuss the state of GT500, its relationship with DTM promoter ITR, its relationship with the ACO as well as plans of a “mother chassis’ for GT300. What is your assessment of the new GT500 class? “The association with ITR allows us to have common regulations in order to contain costs, which is a good thing. The new GT500 car has more downforce than last year’s, which means they’re even faster. “The tire manufacturers have worked hard in this area. Michelin and Bridgestone have been performing from the start, whereas Dunlop and Yokohama had a little more trouble in the first meetings. “We’re allowing manufacturers to change [aero configurations] once a year. So far only Nissan has made that choice and now has a high-downforce version. 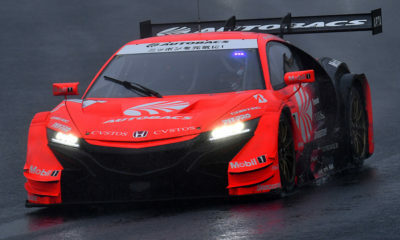 The Honda NSX-GT Concept complies to the JAF GT500 regulations. Does the cooperation with ITR continue? “At present, DTM cars cannot run in Super GT. GTA has proposed to Hans-Werner Aufrecht (ITR boss) to take 15 GT500 cars to China next year during the DTM meeting. This would be part of a joint event, but without the two championships running together. “A DTM engine produced 520 horsepower while a GT500 is at 580 horsepower. One series has common tires where the other has very specific and sensitive [open choice] tires. “In 2017, the technical regulations will be the same but GTA does not want a spec tire manufacturer. To run together [with DTM], it would be a matter of a compromise. “If the German [cars] had to come to Japan, why not open up the air restrictor and vice versa if Japanese cars were to come to Germany? “The culture between the two countries is different. Germans work a lot on the marketing side and promotion, which is not the case in Japan. “GTA has proposed to use Super GT as a marketing tool but manufacturers want to spend their resources in the development of the cars. When will Japanese cars be able to race in Germany and vice versa? Will there be identical technical regulations between DTM and Super GT in 2017? “ITR will adopt the 2.0-liter turbo. It’s complicated to develop 580 horsepower with a 2.0-liter turbo because it requires a lot of money. ITR has proposed to adopt a common Bosch hybrid system. Is the next step developing the common “Mother Chassis” in GT300? “We believe in this new concept. FIA GT3 cars are made by manufacturers with the introduction of customer support. The GT3 ‘Mother Chassis’ goes against that idea. “It is increasingly difficult for teams to run GT3, train the mechanics and engineers. If we continue down this road, the race will be the playground of the manufacturers and not the teams. “With our concept each team will make a difference. For now, only Toyota has taken up the challenge but others will follow with the permission of the respective brands. Will GTA continue to work with SRO? “We’ve asked for help from the SRO in the implementation of GT300 BoP because we believe their BoP established in Blancpain is the best. The teams also agree. The Asian Le Mans Series had a standalone race at Fuji the same weekend as Super GT at Suzuka. Can we see a collaboration between the two series in the future? “We helped the series last year by bringing in GT300 cars during a meeting. It’s no secret that we wanted to run the GT500 champion at the 24 Hours of Le Mans last year, even outside of the ranking (Garage 56) but the ACO did not accept.